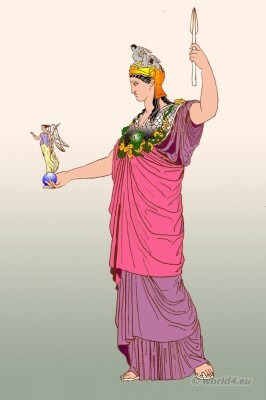 Pallas Athene (Minerva) wearing the aegis with the Gorgon’s head on her breast; she wears the himation as a diplax. This statue answers the description of the Athene of Phidias, in the Parthenon. Ancient Minoan Civilization. The Palace of Minos at Knossos. Gallery: “On the history of costumes”. Münchener Bilderbogen (Munich pictures sheets). Published by Braun & Schneider, Munich c.1858 -1898s. This entry was posted in Ancient, Ancient Greece, Headdresses and tagged Ancient Greek Costumes, Ancient Greek helmets, Thomas Hobe on 8/4/13 by world4.